What Is A Virtual Drum Set? 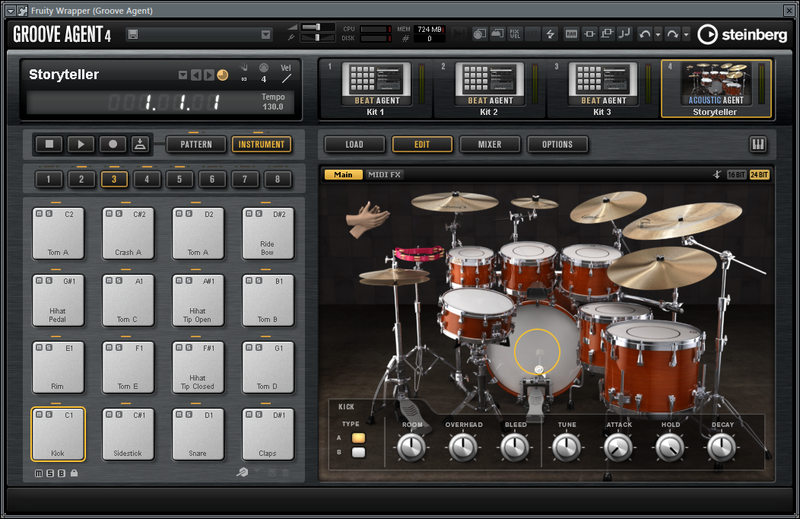 A virtual drum set is a software application that either works in stand-alone mode or as a plugin in one’s DAW. It contains loads of sampled drum sounds, recorded from real acoustic drums, at multiple velocity levels for each piece of the kit. If a kit piece can be played in different ways (e.g., snare drum played with a stick or brush, wires on or off, hit in the center of the drum skin or on the rim, etc. ), then those “articulations” are also found in good virtual drum sets. For each kit piece, up to more than one hundred hit velocity levels are recorded per articulation, depending on the virtual drum set one chooses. The general rule is that the more velocity levels have been recorded as separate samples, the more realistic sound overall that the virtual drum set delivers. Another point is that sound-shaping options can be manifold in top-notch virtual drum sets. Some offer just basic sound-shaping controls, others a complete range of tools that one would find in professional recording and mixing studios. Most virtual drum set software developers have granted their virtual drum sets a nice visual user interface that “beams” and “situates” the user right behind or in front of the virtual drum set. Some DAWs offer virtual drum sets by default. These are rarely viewed as high-quality virtual drum sets boasting all of the functionalities that the above-mentioned virtual drum sets offer; however, that should not hold you back from testing what you might already own. Maybe you will find a few virtual drum set gems you like to play with. To come is a discussion of two free virtual drum sets that I have tested and find useful. This library is part of the free software package that a buyer gets when purchasing one pad controller of the AKAI MPD2 family (MPD218 / MPD226 / MPD232), released in summer 2015. Next to the Big Bang Universal Drums library, another virtual drum instrument, Big Bang Cinematic Percussion, is included in the software package. The package contains about 27 gigabytes of drum sample content, which is impressive for a “free” software package. “DrumMic’a!” is an outstanding and free 8-gigabyte virtual drum set from world famous microphone manufacturer Sennheiser. After a quick online registration, DrumMic’a! can be downloaded from the Sennheiser website. Does the virtual drum set sound “round” and balanced overall? While this might at first sound like a stupid question, you might remember it when coming across virtual drum sets that haven’t produced well enough. I’ve come across virtual drum sets that sounded quite unbalanced and therefore I deemed them unusable for me. All of the above-mentioned virtual drum sets sound balanced, but when testing some low-profile products or drum libraries from companies that aren’t specialized in virtual drums, you might get a sense of what I mean. The overall sound quality of a virtual drum set should be tested purely by ear. All drum kit pieces should sound good in relation to one another in terms of volume levels, tuning, and sound “color” when being played. A snare drum can be played in many different ways. Therefore, its articulations include open hit, rim shot, side stick, rim click, shallow rim shot and variations of those. This set of articulations can be doubled when considering that those are available as samples recorded with sticks and with brushes, because for virtual drums this is a completely different set of samples to be recorded. A ride cymbal can be played with the tip of the stick on the top, with the shaft of the stick on the rim, tip or shaft on the bell, etc. The hi hat offers the most distinct possible articulations. Here are a few: hi hat played with the tip, shaft, open (1/4, ½, ¾, full), closed, on the bell, foot pedal open / closed, etc. All these different playing types require separate articulations in a virtual drum set. While all this complexity might sound daunting, the “functional” relevance of drum sounds is rather limited. You will always recognize a snare drum sound, no matter if it is played as an open hit, a rim shot, a shallow hit, or something in between. The same goes for the hi hat, whose basic musical information is being played “open” or “closed”. It is similar for the other kit pieces as well. The distinction of all the above-mentioned articulations in virtual drum modules is made in order to achieve the most realistic acoustic drum sound possible, should one ever need it—and that’s the point I want to make here. Don’t stop at trying to determine the options that you have: try also to predict your sound necessities. A little helper might be the General MIDI standard for drums, which only contains a short list of special articulations for certain kit pieces. You can download the below list from the XpressPads “little helpers” section, next to other needful files. 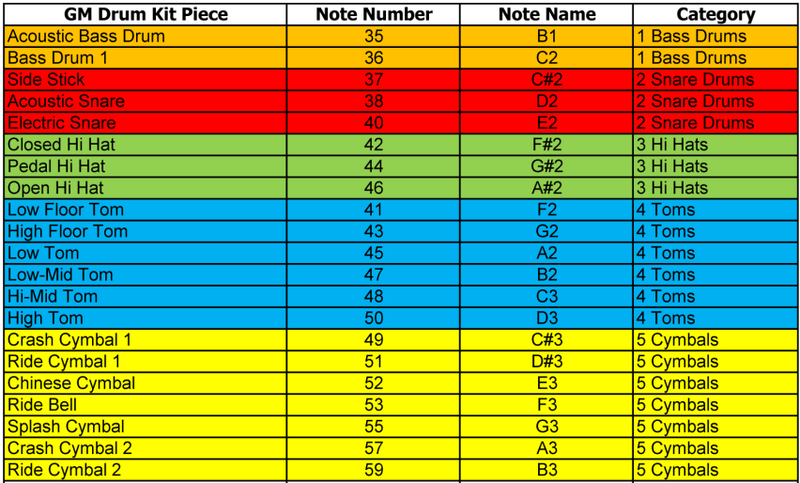 It’s obvious that only the main (read, “functionally relevant”) articulations are available in the GM standard, and I personally think that this is enough for almost all finger drumming applications I can think of. It’s obvious, too, that the full set of possible articulations is only covered by the heavy-weight virtual drum sets. Everyone knows the “machine gun effect” that takes place when repetitions of one and the same drum sample are played at exactly the same volume level. It sounds mechanical, robotic, and weird, especially when it comes to acoustic drums. This effect is, in general, undesirable. That’s why all high quality virtual drum module companies make use of “round robin”, a technique that exchanges drum sounds randomly when played successively at the same volume level. Each recorded drum sample sounds a little different, even if recorded at the same velocity. Creating a set of 3 or more different samples per volume level, or volume level area, creates the perception that a drum kit piece is being hit realistically. Technically, based on the General MIDI standard, there are 127 possible velocity levels. Most virtual drum set manufactures don’t use that range to the full extend with one velocity layer per velocity “step”, but with a good number of velocity layers and a reasonable amount of round robin samples per velocity layer, realistic drum performances can be easily achieved. Another critical point is how successively played drum notes transition over time from low-velocity hits to high-velocity hits. If the virtual drum set has been engineered well, then there should not be any audile “step” when gradually going through the different velocity levels from low to thigh volumes. This is one critical detail where cheap and “light-weight” virtual drum sets can differ drastically from expensive virtual drum set flagships. In general, what are the most basic things that can be changed raw-sound-wise on virtual drum set pieces? 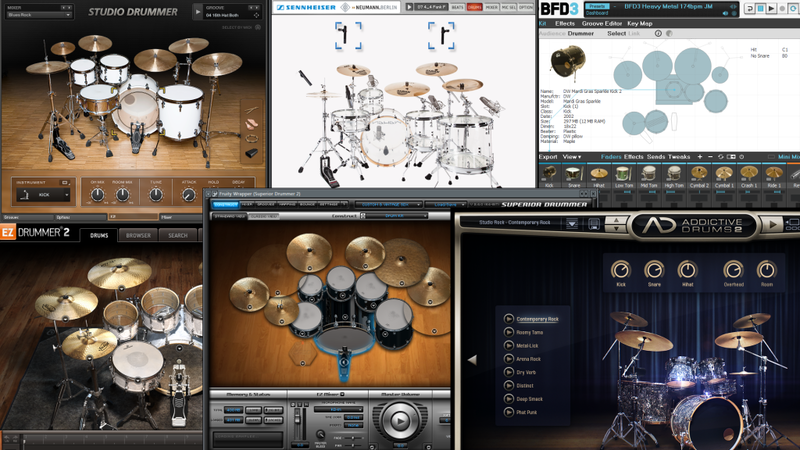 Most virtual drum sets offer a pretty sophisticated range of tools to shape sounds as a person desires. This is where the most obvious differences between the inexpensive, light-weight and the expensive, heavy-weight virtual drum sets emerge. Also, this area might reveal who are the real targets of the equipment producers. 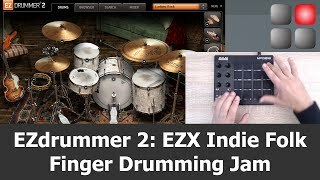 Light-weight virtual drum sets are focused towards hobbyists and people who want to use them primarily for fun, while heavy-weight, highly-functional virtual drum sets are made for music production pros who typically work with a high-performance computer setup. I seldom use all of the sophisticated features provided, probably because I am also a friend of factory presets; still, I like to have those features if I did decide to employ them. When I mix down a song and need to do some detailed changes to the sound, I go into the dungeons of meticulous sound fine-tuning. Before you buy a virtual drum set, ask yourself what you really want to use it for. If too many tech features intimidate you and your computer has already shown you its limits, a heavy-weight virtual drum set might not be the best option for you. Many virtual drum sets today come with an included mixer and an effects section. That’s particularly helpful to create completely different virtual drum set sounds. It makes it easier to make a virtual drum set fit better into a music production and to make it sound appropriate for different styles of music. Moreover, included mixing and effects features are most often specifically geared towards and prepared for mixing drums. That means a person doesn’t have to create sophisticated external mixing and effects algorithms to achieve a desired drum kit sound. Applying effects right in the virtual drum set software usually provides a much more dedicated and intuitive workflow. Factory presets are helpful to quickly search for drum sound settings that fit well into an existing music mix that requires drums. I like when virtual drum sets come with a huge number of presets. That saves me a lot of time, because with many factory presets it’s easier to find a good starting point without getting to much into the depths of mixing drums and using effects. Once a good preset is found, it often just requires a few more tweaks to make a drum kit fit perfectly into the overall sound mix of a song. That’s why I think that it’s good to have a virtual drum set that comes with many factory presets. The option to change MIDI mappings is very important to me. When working on a song I usually test different virtual drum sets for how well they fit into the overall sound mix. I definitely prefer virtual drum sets that offer the option to change MIDI mappings on the fly because this saves me time, thereby helping me keep the workflow simple. For the XpressPads finger drumming technique, I use the General MIDI drum sound mapping. At the very least, this mapping should be available in any good virtual drum set. Having to re-map the drum notes every time a new virtual drum set is loaded is a cumbersome, workflow-slowing process. Imagine remapping kit pieces manually every time a different virtual drum set is loaded. That’s really annoying. Load times and the size of the sample library are important factors of virtual drum sets because these can have an impact on both performance and on workflow. If a 10-gigabyte virtual drum set with several thousand individual samples included is installed on a regular hard drive with a speed of 7,200 rpm, it will take quite some time to load into RAM… (even though most virtual drum set applications only load the first part of the included audio files to RAM and stream the remaining part from disk once a sample is triggered). This means sitting and waiting before being able to go ahead with the creative activities that take place during the music production process. The longer the load times and the bigger the sample library size, the bigger the imposed break in the workflow – and thus the bigger the distraction. That’s why I prefer small-size virtual drum sets over the big ones. Most current virtual drum sets are expandable. This means that additional virtual drum sets can be purchased and are available in the same GUI environment that the main application provides. 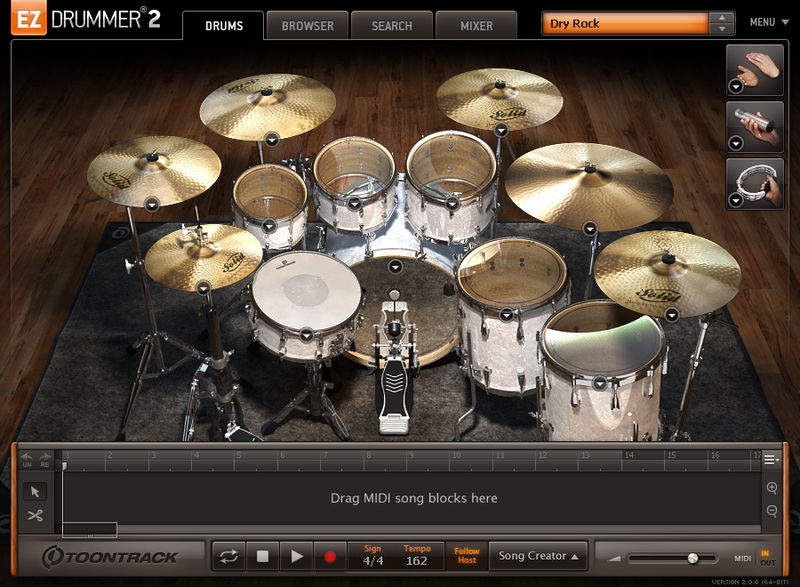 Additional virtual drum sets increase the sound palette for creating drum tracks. In particular, it is beneficial to have virtual drum sets at hand, when producing music for different genres, that sound appropriate for those different genres. Furthermore, virtual drum set expansions usually don’t cost as much as the main application, and therefore can be an inexpensive way to increase the number of sound options. I only need to estimate the “flight hours” for all my virtual drum sets to see which ones are the most valuable to me, regardless of their price. Note that there seems to be a relation between gigabyte size (read, “number of samples included”), number of sound shaping features, and price. This aspect relates more to the feel that one gets when playing finger drumming with virtual drum sets than to the actual audible features. Certainly sound quality is the most important aspect of any virtual drum set; however, if the setting that the GUI places one into provides the feeling of sitting behind a real instrument, it will enhance the feeling of playing a real instrument. 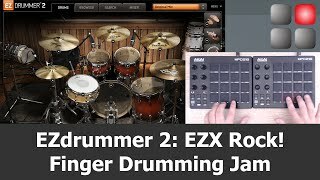 This improves the workflow and quality of the finger drumming performances one plays on that virtual drum set. I believe that this cannot be underestimated, because “being attached” to a (virtual) instrument is an integral part of the creative process that happens when one makes music. A nice-looking virtual drum set that provides visual feedback for each kit piece when hit – like the impression of vibrating drum skins and shivering cymbals – will produce a perception in the player’s head that he or she is playing a real drum kit; this improves the overall musical performance. After all that being said, what does my top 3 list of virtual drum sets look like, and why? 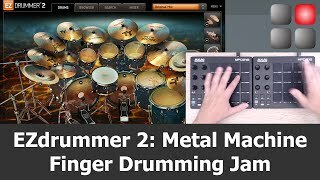 Addictive Drums 2 meets all my needs as a finger drummer. Almost all (expansion) kits that are available for Addictive Drums 2 sound great. The interface is easy to use. The mapping for all virtual drum sets is consistent across all expansion kits, which lets me focus on the music and not change mappings any time I load a new virtual drum set from a different expansion pack. The sound shaping options are manifold and intuitively to control. The user interface looks sleek and appealing. If needed, I can MIDI-learn single drum sounds or layer them with other drums. The presets load extremely fast since the sample content isn’t overwhelming. This, however, doesn’t have an adverse effect on the drum sounds and sound transitions. 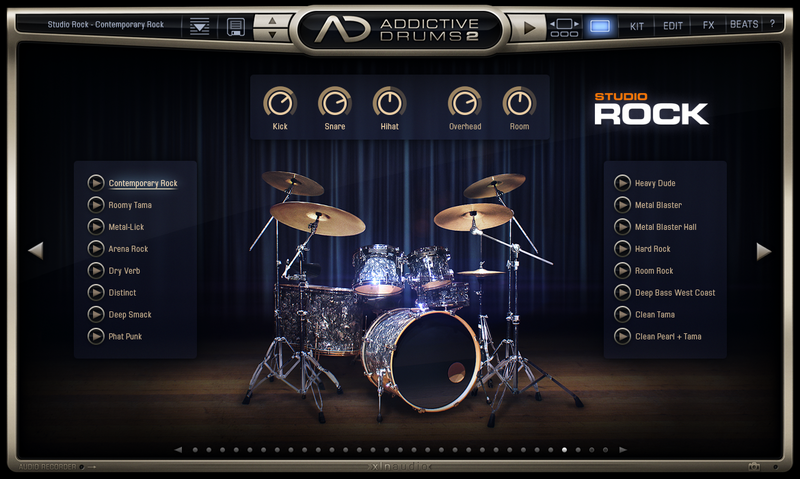 Overall, this makes Addictive Drums 2 a virtual drum set that fits perfectly into my workflow. Studio Drummer and Abbey Road Drummer for Native Instruments’ flagship sampler “Kontakt” sound fantastic. There is hardly a difference (if any) between Studio Drummer and Abbey Road Drummer in terms of the engine that these virtual drum sets use. All virtual drum sets sound very organic and “round”. MIDI-learn is available and presets can be saved. MIDI mappings can be changed on the fly. There are several Abbey Road Drummer kits available, all serving a different style of music genre and decade. Each virtual drum set comes with some – although not many – presets. If those don’t fit a production well enough, the simple yet effective mixer section will provide the tools to make the needed changes. Their big sizes create the one admittable downside of Studio Drummer and Abbey Road Drummer: load time. I don’t like waiting, especially when I am in the middle of a musical project. 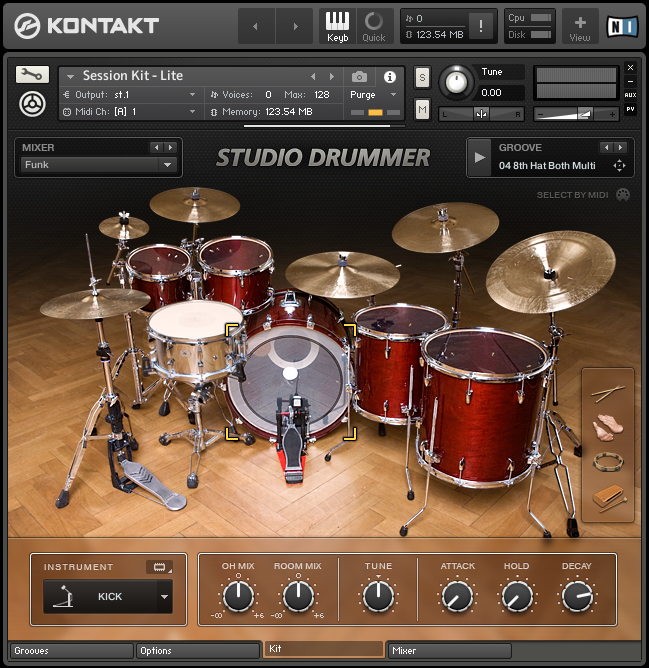 Studio Drummer and many of the Abbey Road Drummer virtual drum sets are included in the KOMPLETE bundles that are sold by Native instruments. Those software bundles aren’t cheap, at first glance, but they offer value for the money, especially if one just starts off making computer-based music. EZdrummer 2 comes with a huge family of expansion packs. Those make it a versatile virtual drum set for any purpose. The sounds of most expansion packs are very good, although there are a few that sound thin and are hardly useful; still, I think that conclusion differs based on personal taste. In some cases, the transitions between low-velocity hits and high-velocity hits change the sound quite drastically, which I personally don’t much like. Although loading presets doesn’t take a lot of time, the preset management is rather rudimentary. One thing that I really see as a downside of EZdrummer 2 is a missing custom mapping function. Mappings are fixed in EZdrummer 2, which can make it painful to manually adjust mappings when changing presets in the middle of a music production. The GUI looks beautiful and changes with every EZX expansion pack that is being loaded. The mixer page is rather limited, but gives access to the most important sound and effects controls. 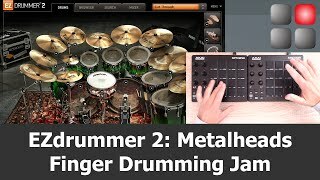 So… what is the best virtual drum set for finger drumming? I have listed my favorites above, but that doesn’t mean that those will in turn be your favorites. It really depends on how far one wants to go with finger drumming and virtual drum production. I appreciate ease of use, combined with the options to go deeper if I need to. I like virtual drum sets that load quickly and are flexible in terms of mappings. I am fine with the standard midi articulations plus some useful special articulations. What I don’t need is an overwhelming arsenal of effects. In cases where I crave those, I can still rout the different drum tracks from the virtual drum set plugin to the tracks of my DAW. What I do like are all the raw-sound shaping features listed in the respective section above. If your computer shows weaknesses with other software that is resource-hungry, you don’t even need to think about buying a heavy-weight virtual drum set such as BFD or Superior Drummer . That situation forces you to work with one of the light-weights such as BFD Eco , EZdrummer , or even Addictive Drums . If you’d like to offer feedback on this virtual drum set review, use the “comments” section below or the video commenting functions on YouTube or Google+. We’re interested in your thoughts and your experience. If you found this virtual drum set review helpful and consider purchasing the product, we’d appreciate it if you’d use the below Amazon link. It does not cost anything additional, but that action helps us keep up the work that we do in order to bring finger drumming to the people. Many thanks in advance!